Music on a jet ski can be a must have, but what jet ski speakers do you get? Over the years I’ve seen some good ideas and some downright bad ideas that I talk about in this post. Please don’t make the wrong mistakes when you want music for your jet ski. 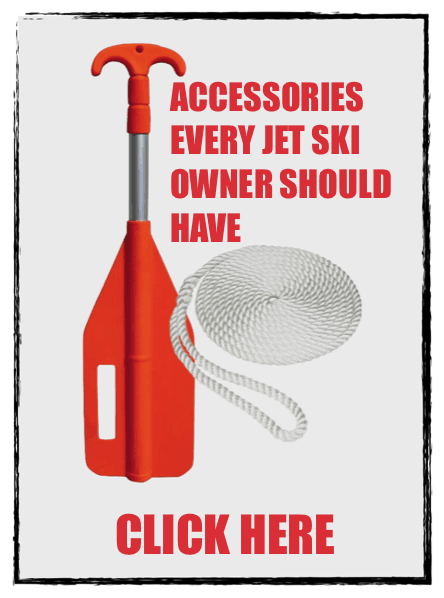 We also have some cool installs that people have done and easy/cheap ideas for music on your jet ski below. You can get some stock jet skis with built-in speaker systems. It’s mostly Kawasaki that does this and only on a few models. You can see them here if you want to learn more about them. Will more manufacturers do stereo systems? Probably not. That is why it’s a good idea to get a stereo system for your jet ski now. Some states require you to have working mirrors on your jet ski for pull sports, and since some people replace the mirrors with speakers, you got to keep that in mind. 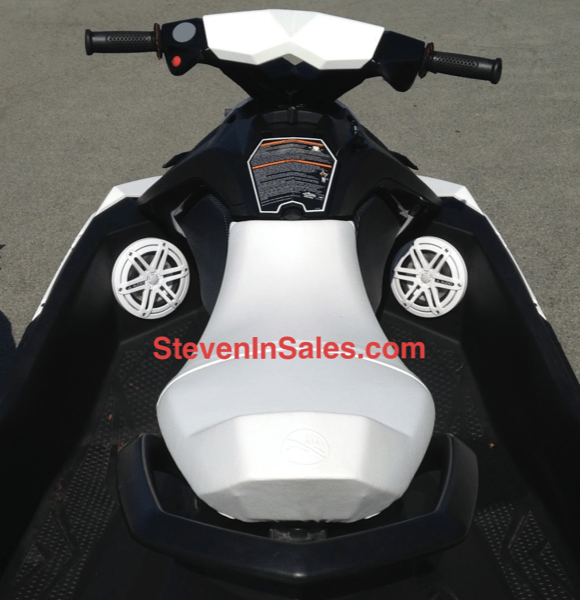 If you do add speakers to your jet ski, I recommend adding the ones that mount below the mirrors or off to the side like these here. This way you still have your mirrors and music. Let’s not forget that loud music can be distracting. When playing music you need to be more aware of your surroundings. I know it sounds crazy especially when you listen to music in your car all the time. But a jet ski and boating is different. You don’t have roads to keep people on track, and a lot of people are not paying attention to where they’re going so you must be more aware. If you want my opinion, I say go with the portable Bluetooth speakers. These things have come a long way and some even put out more sound than you might think. The beauty of a Bluetooth Speaker is that you can take it with you when you get off the watercraft or hang around the pool. It won’t’ matter where you go, even if you beach the watercraft or chill on the water, you’ll have a Battery Powered Bluetooth Speaker to keep the music going. Try to get the Bluetooth speakers that are waterproof because that is where it will be used most often. Another key factor is looking for speakers that are sand-proof too. This should not be hard as there are many options for Bluetooth portable speakers these days. Will it be loud enough? I know this is the number one question someone might have about getting a Bluetooth portable speaker for their jet ski. It’s a fair question, but yes, most will be loud enough. What I like to do is store it in the glove box which acts as an echo chamber to help keep it loud and away from the elements. If it’s got to be loud, then you got to get the custom speaker job done on your jet ski. Many audio places will do it, even the ones that do cars and trucks. This option will be the most expensive one but the best-looking one. I’ve had people do this to there sparks which work well for speakers like this picture below shows. The Negative – There is a downside to going with the custom speaker installs which some might not even care about. The number one downside if you ask me is that it will take away your storage. Often the subwoofer and amps get put in the storage compartments of the watercraft. Another negative (and it’s pretty big too) is that they have to cut holes into your jet ski. The holes will be for the speakers to go through. The bigger the hole, the more it weakens the structure of the body. These holes and speakers might even lower the resale value of the jet ski if the next owner doesn’t want it. 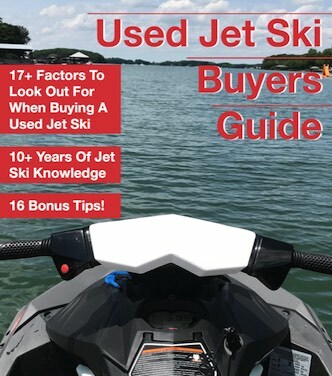 When it comes to resale value, it’s best to keep the jet ski looking stock because the next guy might not care how cool it looks. Even with the few negatives, there is nothing like having a sound system that can overpower some of the boats on the water. Plus, it looks cool too. When you do get the custom speaker system installed, make sure they epoxy the holes they drill really well just in case you flip the craft it doesn’t sink from the speaker holes. Where you place the speakers is important. You must keep the wind in consideration when riding. So placing the speakers behind you facing forward does not work as the faster you go, the harder the speakers will have to work and the quieter the music will be. I see people buy ATV speaker tubes and mount them behind them facing forward and the only thing holding it on his some straps. Don’t do that. The straps won’t hold for long with all the wave jumping, and the music gets muffled because the speakers are facing forward and when you go over 40mph you can’t hear the music. Overall, don’t use speaker tube systems that are made for ATVs. ATV speakers systems are big and hard to mount on a watercraft. It just doesn’t work or look right no matter what other say or show – when you get it out in the real world and use it they don’t hold up. Here is a list of some of the coolest jet ski speaker installs I’ve seen. Curious if you installed another battery. When listening to the system and it is not running, does it kill the battery fast? If so, can you install a dedicated battery for the system? If you’re going to be running the stereo all day long I would highly recommend a second battery.